Bertha Billingsworth (BB for short) is basically a happy person until she has to take a test. To her, the word test stands for Terrible Every Single Time, because that’s how she does on them, TERRIBLE! Whenever I see or hear the word test, The hair on the back of my neck stands up. My face turns as red as a beet. I start to sweat, my stomach aches, and I can’t control my feet! What if I get every answer wrong? And I don t get any right. 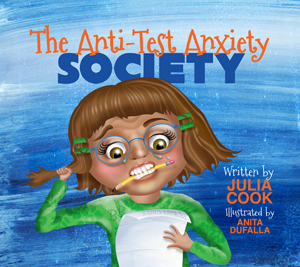 BB’s teacher comes to the rescue by inviting her to become a member of the Anti-Test Anxiety Society. She tells BB that TEST stands for Think Each Situation Through! She also ends up teaching BB the Dynamic Dozen (12 amazing test taking strategies), and convinces her to use her “GET TO” brain instead of her “HAVE TO” brain. Now when BB takes a test, she is calm and focused and thanks to her teacher, the Terrible now stands for Terrific.